nourished by diverse cultural impulses and boasting a polyglot modernity articulated in Portuguese, Konkani, English and Marathi. 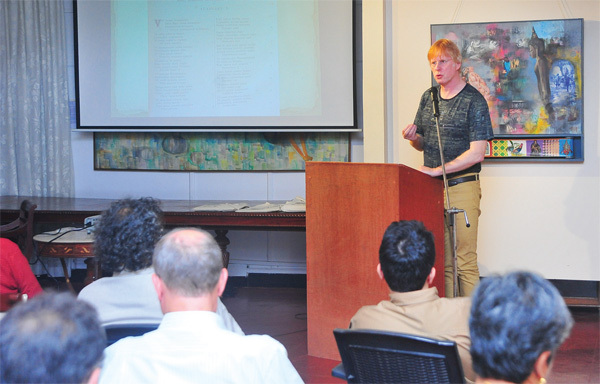 This was the topic delved into at the panel discussion - ‘In the shade of the Calpataru ‘ - hosted by the Museum of Christian Art (MoCA) in collaboration with the Chatrapati Shivaji Maharaj Vaastu Sangralaya (CSMVS),Mumbai at Gallery Gitanjali, Panjim on February 15, 2018. This programme was part of the ‘Itinerant Institute: Metro City Outreach Programme’ organised by CSMVS as part of the ongoing international exhibition India and the World: A History in Nine Stories - one of the country’s most ambitious exhibitions. Jonathan Gil Harris, Shakespeare scholar, author of‘The First Firangis’ and professor of English at Ashoka University, Sonepat was one of the three main panellists for the evening along with Aneesh Pradhan, musician, composer, author of ‘Hindustani Music in Colonial Bombay’, Director of Underscore Records Pvt Ltd, and Ranjit Hoskote, poet, cultural theorist, curator and the author of ‘Confluences: Forgotten Histories from East and West’. The panellists articulately addressed the emergence of experimental literary, musical and theatrical forms at the cusp of unexpected encounters. Among other figures, the speakers discussed the Rev. Thomas Stephens, the English Jesuit who wrote the ‘Krista Purana’ in Konkani and Marathi; Kesarbai Kerkar, the renowned vocalist who migrated from Goa to make a seminal contribution to Hindustani classical music in India at large; and Abbe Faria, a Candolim-born monk and scientist who appears in Alexandre Dumas’ The Count of Monte Cristo’. The India and the World: A History in Nine Stories exhibition, is presented as a collaboration between CSMVS, the British Museum in London and the National Museum, New Delhi, with the support of the Ministry of Culture. Supported by the Tata Trusts and the Getty Foundation, this project is planned to coincide with the celebrations of 70 years of Indian Independence and the year of a major cultural exchange between India and the UK. Additional support is provided by the Newtown Bhabha Fund. The exhibition showcases some of the most important objects and works of art from the Indian subcontinent, in dialogue with iconic pieces from the British Museum collection. It highlights the strong connections India has shared historically with the rest of the world, promoting an exchange of ideas and influences that have helped create a global culture. The exhibition shares with viewers nine stories drawn from important eras in India’s history. Iconic objects selected from different museums and collections across the country are placed in conversation with objects from around the world drawn from the collections of the British Museum. The return of Sunburn: Goa’s gearing up for a Klassique! What kind of republic are we celebrating?